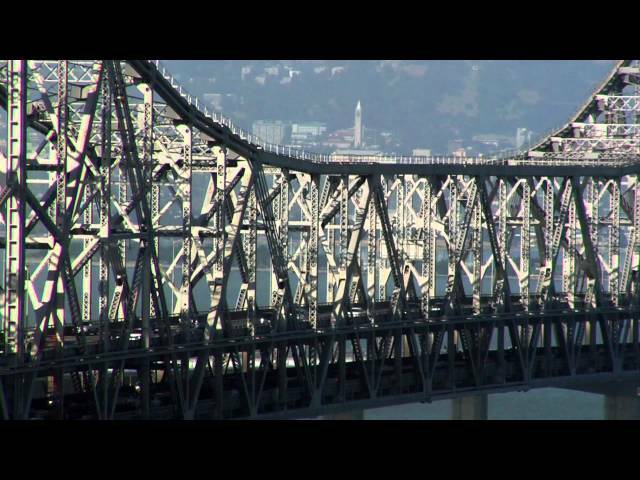 On our quest of interesting things to shoot from the air, we visited the Port of Oakland in Oakland, CA. Winds were blowing in the 15-25mph range. I was flying a DJI F550 with Naza and GPS. I'm using a GoPro Hero2, Immersion 600mw 5.8GHz video transmitter and a XAircraft camera gimbal to shoot. Props are Graupner 9x5 E Props and I'm using 4s 5000 sky lipos. The ship is the Hanjin Dallas. The nice elevator ride to the top with a trott across the catwalk to the electricalhouse where the crane's pc is located. Learn international business, world trade, import/export logistics at Golden Gate University, classes are available online to allow you to get your degree while you study online. Class OPS 113. Please subscribe now to see more videos like this one. 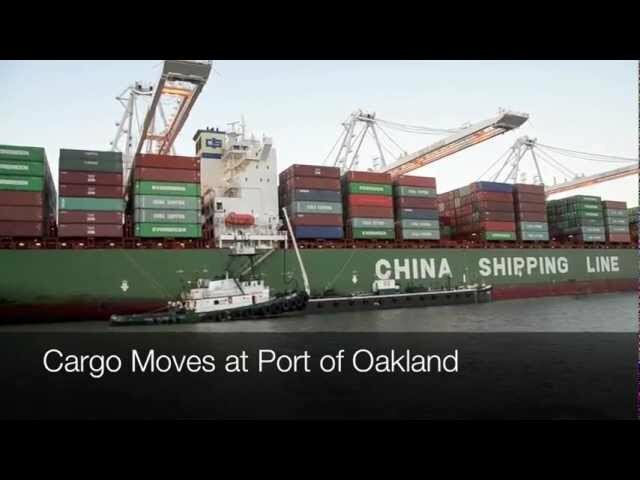 History was made at the Port of Oakland, March 21-22, 2012. 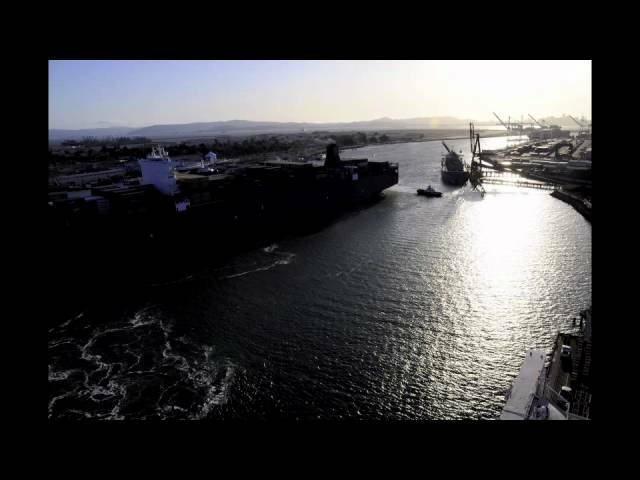 Here is a fun, time lapse video to watch of the MSC Fabiola. 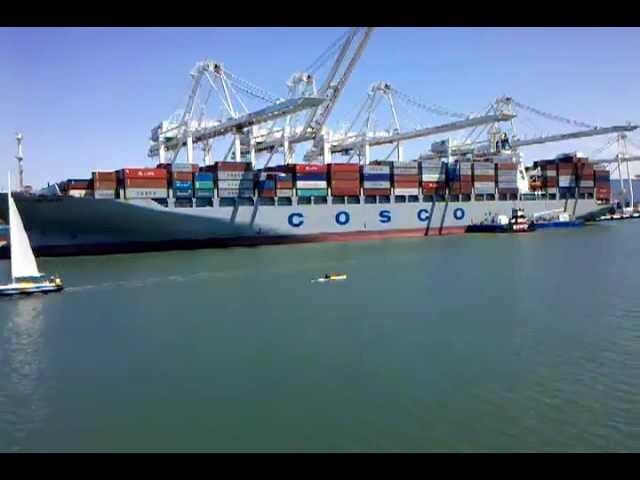 This vessel is the largest container ship to call North America and the Port of Oakland to date. Enjoy this fast-paced video as tug boats powerfully guide this massive vessel in the turning basin, before it departs for Asia. The ship is loaded with US exports for overseas customers, and serves as another great example of how the Port of Oakland is tied to 73,000 jobs in our region and 827,000 jobs across the United States. Ferry Ride Alameda Oakland Estuary, Container Ship Cosco Antwerp, Port of Oakland. Oakland, CA -- August 2, 2010 -- Port of Oakland has been adding state--of-the-art super-post-Panamax cranes over the past decade to handle the larger containerships that now transit the globe. When the Alameda Naval Air Station was in service, Oakland used low-profile cranes to accommodate flight-path safety issues. Since the base closure, those cranes are no longer needed here. Meanwhile the Massachusetts Port Authority (Massport) needs low-profile cranes due to the proximity of its container terminal to Boston Logan International Airport, also owned and operated by Massport. The Port of Oakland and Massport cooperated so that the cranes from Oakland could be re-used at the east coast facility. The first part of this engineering feat has been completed. The cranes have been loaded aboard a barge and pulled away from Berth 37 at the Port of Oakland this morning, a few minutes after 11:00 a.m. Monday, August 2, 2010. 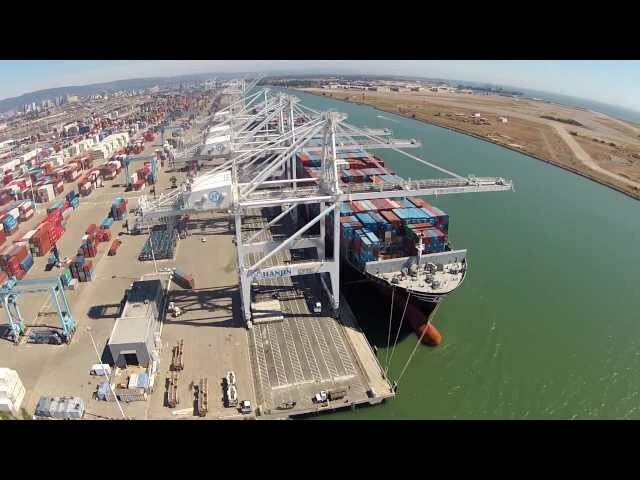 Port of Oakland Maritime Director James Kwon said, "We are pleased that our low-profile container cranes are going to be put to good use at Massport. This demonstrates how the port industry is making conscious decisions for the environment whenever possible. With the re-use of these cranes, we are reducing waste and saving resources, and Massport gets cranes that are ready to put in service." Each low-profile crane is made of 1,200 tons of steel.